Definition: The Job Design means outlining the task, duties, responsibilities, qualifications, methods and relationships required to perform the given set of a job. 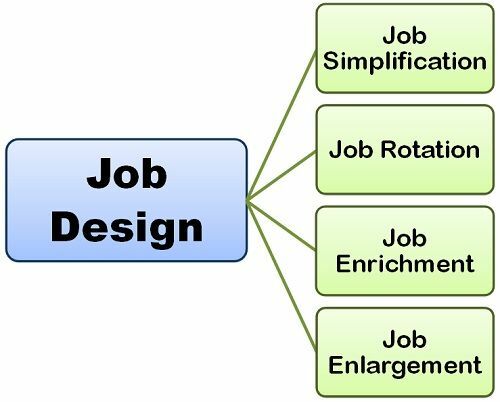 In other words, job design encompasses the components of the task and the interaction pattern among the employees, with the intent to satisfy both the organizational needs and the social needs of the jobholder. The objective of a job design is to arrange the work in such a manner so as to reduce the boredom and dissatisfaction among the employees, arising due to the repetitive nature of the task. The foremost requirement for a job design is to define clearly the task an individual is supposed to perform. A task is the piece of work assigned to the individual and who has to perform it within the given time limits. The management must decide on the level of motivation that is required to be enforced on an individual to get the work completed successfully. Thus, the managers must design the jobs that motivate his employees. The managers must decide critically on the amount of resources that needs to be allocated to perform a particular type of a job. Thus, the efforts should be made to make an optimum utilization of organizational resources while designing the job so that the organization does not suffer any dilemma due to the shortage of its resources. When the jobs are assigned to the individual, he agrees to do it because of the rewards attached to it. Thus, the manager must include in the job design the compensation, bonuses, incentives, benefits and other remuneration method for the employees. Thus, the job should be designed with the intent to find a fit between the job and its performer, such that the job is performed efficiently, and the performer experiences satisfaction while performing it and give his best efforts towards its completion. The above article discusses several techniques to associated with Job Design Theory. That is a good discussion.